For this week’s issue we are being inspired to remember that we live in a benevolent Universe and Creative Solutions abound! We are really being challenged to trust these days. If we look outside ourselves to find goodness, it is often difficult to see. With so much change swirling in the world around us and within our lives, it is even challenging to trust that there is a benevolent outcome. Archangel Gabriel sprung the idea of Creative Solutions on me in a meditation in 2006. At the time I was needing to find a new place to rent. I needed to leave the house where I was living in two weeks. I had discovered that there was such a shortage of rentals in the area I was looking that a walk-in closet was for rent and actually had a waiting list. I had a loose verbal agreement with a friend for her cottage, even though I knew it was only temporary and not the perfect place for me. I had enjoyed being in the sweet spirit of Hawaii for 20 years, loved the beauty and the culture, and had no intention of leaving the islands. During my meditation that morning, Archangel Gabriel had impressed on me that no matter what the situation was, no matter how dire things appeared, Creative Solutions Abound! Those were the words, including the exclamation point. I was told that there is always a Creative Solution available within the Divine Mind. That sounded great, so I asked for a Creative Solution in my housing situation, and I gave thanks in advance, knowing it was so. When I started my day, I decided to give my friend a call to see when I could get inside the cottage. She seemed surprised and very casually said, “Oh, I rented it to someone else.” I don’t remember any more of the conversation because I was going through a number of emotions very quickly. Panic was the first, anger was the second, but then humor was the third as I remembered my conversation with Gabriel that morning. Once again, I proclaimed Creative Solutions, blessed her and hung up the phone laughing. In the week that followed I found no place to live that worked for me. It became obvious by the divine discontent within me that it was time to leave my beloved island home. Obviously that was the Creative Solution that I had never considered. I made plans to put my car on the ship to the mainland U.S., and every step I made from then on seemed blessed with amazing synchronicity and divine assistance. Seven years later I was living in Mt. Shasta, a place I truly love with a soul community I had prayed for but never experienced. I have learned to trust that there is a universal flow of Good, that we live in a benevolent Universe and that when I call forth a Creative Solution, one will be there. The Gabriel Messages #40 Trust in the universal flow of good and know there is a Creative Solution in all situations. The Divine Presence is an energy which is omnipotent, everywhere present and has infinite capacity for good. This energy flows through you and surrounds you at all times. There is never a time when you are not a part of this energy flow of God, the essence of Divine Love. In this you can place your trust. You can also be assured that regardless of where you are or what the situation is, all energies flow to the highest good for all concerned, at all times. You can trust that there is always a Creative Solution in any situation no matter what it looks like. You can set an intention in your mind or on paper for what you want to see manifest in your life. This gives direction to the universal flow of energy. It’s like holding a vision of your target in your mind, and then taking aim with a bow and arrow. When you release the arrow, you trust it will go where you aim it. The power of God is the energy behind the release of the arrow, but you are the one who takes aim. When you clearly know what qualities you want in your life, this Universal energy will flow where you want it, following the direction of your intention. The qualities we refer to are qualities of consciousness — like Peace, Love, Harmony, Joy, Courage and Abundance. All these words have been used to describe qualities of the Higher Power, and as they manifest through the universal flow of energy in your life, they create the perfect outworking of your soul’s expression in every situation. You are meant to experience Happiness, Love and all that is Good. You have a divine right to ask for these qualities to manifest. Regardless of your circumstance, begin now to be very clear about what qualities you want in your life. Write them down. Post them in a place where you will be reminded. You can set the course for your life in this way. Review your intentions often and remain aware of them when circumstances seem upsetting. It is in those moments of upset that you can clearly ask for Divine Order and Harmony to manifest. After that, you need to let go of control and live in Trust. You are cordially invited to join Shanta Gabriel with the Mystical Teachings of the Archangels for creating new forms in your life using Divine Light. You will be able to empower your world by weaving Light Fields into your dreams of a new reality. In this 5-teleconference series, you will develop inner strength and the ability to transform feelings of scarcity and disruption. As you are empowered in your connection to your Source, you have access to your Soul’s purpose. Nourishment is offered to soothe your over-stimulated nervous system and connect more deeply with your heart’s intelligence. You will create a sacred sanctuary within where you receive guidance from the deepest wisdom of your most divine self. You can emerge from your inner Temple of Light feeling nurtured, more at peace with yourself and with your life. Through these practices you can create your most Empowered Future. When you learn to use the new frequencies of Divine Light that are available now, you can bring forth transformative energies for the creation of your dreams. More than ever before, Divine Light is the key to transforming every area of your life. A new, very special meditation gift is being offered for all those who register for this program. 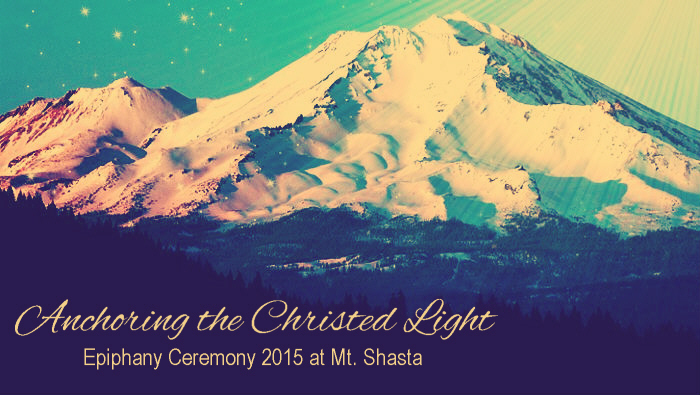 It is called Anchoring the Christed Light, professionally recorded on Epiphany, January 5 at the foot of Mt. Shasta by Shanta Gabriel with a background of crystal bowls played by Dharma Cohen. It is also available for purchase here.